One of the less successful times I pitched Seed rpg to a publisher I got questioned about the game’s use of stats. At first I was confused, as if they asked why my hands had fingers. RPGs just have stats. I have an answer but it’s not something I was able to explain quickly at that time. This question haunts me now as I try alternative methods of resolution. My first reason to use stats was the sense of character differentiation and progression they provide. If numbers are different from one character to another they say something. If numbers go up then players naturally feel something has gotten better. Stats feel like an easy way to accomplish this. Alternatives are things like giving characters lists of abilities, card decks, or key words. Seed rpg has 10 stats, thats almost twice as many as DND and way more then you would find in something like a JRPG. The stats I chose were to allow for variation in how characters accomplished goals instead of attempting to model reality. Instead of having a “fight” stat and have the probability of winning a fight based on that single stat. I had dexterity, senses, strength and agility. With these a character could tackle physical conflict with a variety of means. The hope was to inspire players to narrate their unique character’s methods in achieving a goal. Two characters could be equality capable of wining a fight but in very different ways. Princess Bride was a source of inspiration. I wanted stats that could make all the heroes and villains in that movie work as playable characters. That movie has a perfect cast of characters. Seed RPG uses stats for resolution but it also uses them as a resource economy, Wealth and connections are used to gain items and favors. Spirt and health are sacrificed to learn new traits or raise other stats. There are also ways to convert these stats into each other. Spend Wealth/connections on an R&R scene to gain back Health and sprit. This resource economy is a motivation to keep playing the game. Given it’s all just numbers written on a piece of paper it’s very cheap component’s wise. I don’t need to have massive libraries of cards for player’s to build a deck, I do not need huge books of abilities for player’s to compose a list from. Why I bring this up now is I have ways I could replace the stats from seed RPG like I am replacing the dice. I am elbow deep in this engine and taking an inventory. I use this blog as a part of my working process. I ask myself a question and see if I can figure out the answer. At this point I don’t know if stats will be changed but I wanted to question them and see if they are worth keeping around. Thanks for reading and please comment if you have your own thoughts and questions. 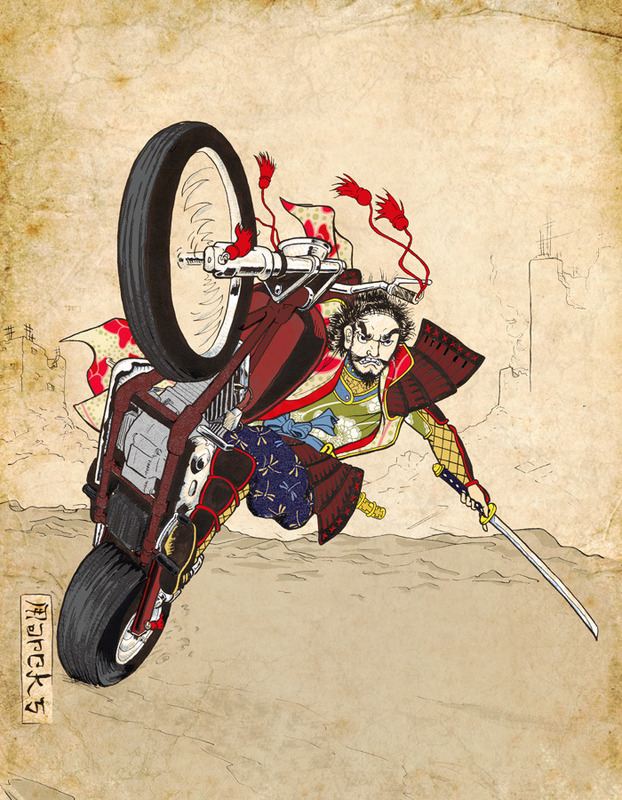 Have you played motobushido yet? Look at this. You have now played motobushido. From now on you are never not playing motobushido. The only part your missing is how motobushido and many cel-style games like it resolve scenes using card play. I will break down the player activity step by step. Players are dealt a hand of cards from a standard poker deck. Cards are played in turn with players adding narration for what they did. When one side loses the card game the scene is resolved and it’s effects are narrated. Compare to the pacing given by typical dice resolution. A conflict scene starts initiative and rules in play are determined. Typical dice resolution has three pauses. Playing scenes with this method takes a long time. rolling dice takes time, reading the small numbers on the dice and doing math takes time. The pacing of the story and narration slows down to a crawl. it’s as if every action scene is playing out in slow motion. The card method’s main pause is when players determine what rules are in play and deal cards. When players are dealt a hand of cards they are given time to process what the cards mean to the narrative and can mentally prepare how the hand will play out. The back and fourth of card play is very quick! it’s quicker then players can usually narrate and does not pause the action in a scene. scenes can take as long to play as they would take an audiobook narrator to speak. This does not mean there will be no pauses when player’s take turns describing their actions, everyone has moments where you draw a blank. what this means is there is no point in a scene when the game it’s self forces a pause. The use of physical cards or dice is not the important detail. You could have a game that uses a hand of pre rolled dice, or a game that requires cards to be flipped from the top of the deck instead of rolling a die. The important detail is when does a game let players process the effect the mechanics will have on the story and how often do the mechanics make players stop speaking. Seed rpg has pauses and I will execute them with the discipline of a samurai and the brutality of a biker. I fully endorse playing motobushido with Nathan if you have the chance. i have not read the book yet but the gameplay is great! Few people actually go through the pain of assembling a print n play game so i’m going to try and wet your appetite for Nacho Combo. It’s a fast paced tile game in the style of Rummikub. A “set collection” game. Thats too textbook I would describe it as a high quality family game of the sort rarely made today. It provides a quick yet deep and satisfying play experience. Saying that makes me feel weird so let me try to explain why this game works. 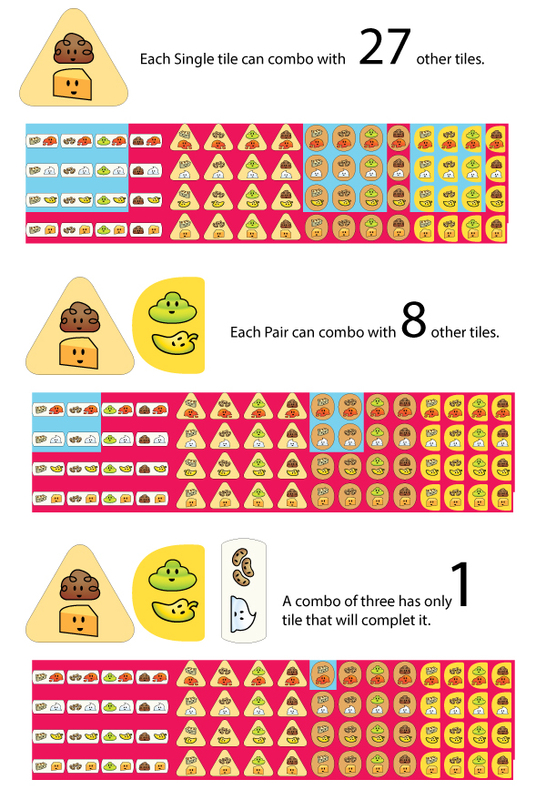 The secret sauce is how the tiles are constructed and how the combo set collection mechanic functions. here is a clip from the rules to help you understand. With these rules creating pairs is easy. It gets harder to match three and then insanely hard to finish a combo by finding the one tile in the set that will work. Here is a diagram to describe it. I bought some “Fate Dice” (the the sexier younger version of Fuge Dice), I’m going to use them for Seed RPG. If you have been paying attention to the lesser details you know this is not really a change in rules but a change in presentation. detailed explanation of dice mechanic is here. I’m still going to print the rules with diagrams that work with pip d6 but there is something primal with fudge dice in this context that I love and I’m willing to close whatever doors supporting them may cost. Now that sounds a bit overdramatic for most RPG players that love weird dice but my school of thought is one I take from Jake Richmond. Dice are Dice and very few RPG’s have ever shown me a compelling reason for not using a D6 or 2D6, it is very rare that a game using step dice D4-D12 actually does this without making dice rolls harder to understand. fudge is actually a great example of this there is very little mathematical and practical reason to use the clasic 4DF instead of the 2D6. but how would using the DF close a door. it’s not what people expect to roll. even if it’s compatible with D6, that idea takes more time and attention for the audience to understand. The way I present the game will be what people expect the game to be. a small niche hate fudge and thus hate fudge dice. Some really easy to understand dice that feel custom tailored to the dice pool mechanics in my game. Fudge dice are brilliant in that they use an international mathematical symbol for positive and negative. regardless of context you can understand if each result is good or bad in an instant. 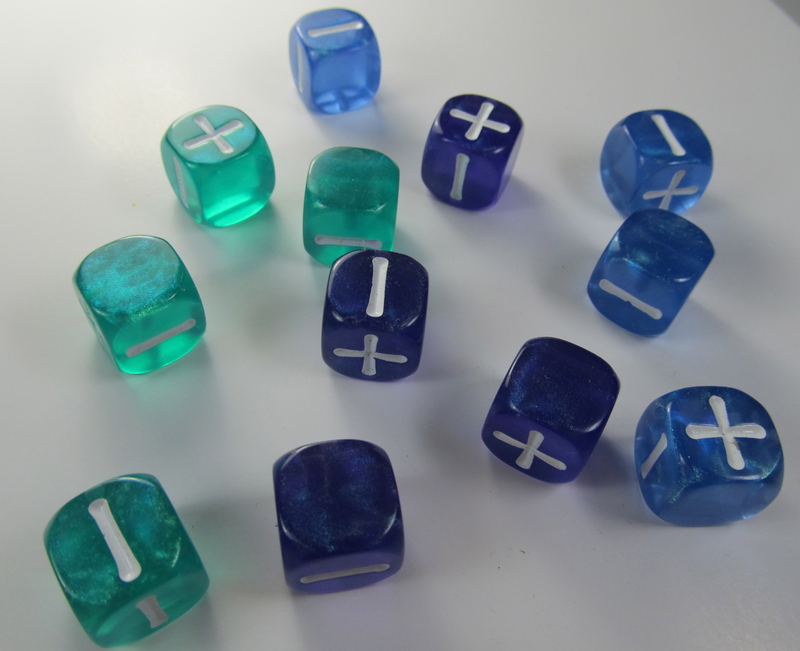 In personal tests the clarity hear can save precious seconds recognizing symbols over the course of a die roll. Table top roleplaying games are like classical music before recording was invented, they require a group of well trained players and some forms even need a conductor to manage the tempo and color of a performance. Live music is real magic, I want slight of hand. I want to make terrible pop music that sounds great from the cheapest of headphones. I want to make bad pop music so we can build good pop music on top, leading to blues, rock and thousands of new forms. I aspire to make what old people call noise. While I enjoy writing that sort of fluff after slamming a bunch of caffeine I have to say it feels way more ego/manic than I feel 99% of the time. my leg is currently bouncing and I anticipate a nervous crash after I post this. In 2009 I went to NY Toy Fair. While I came very close, that trip did not result in getting a game published. What it did was give me a huge case of writer’s block. I stopped designing games, shelved most of my current projects and struggled. I held my projects to a newer standard but i did not quite understand what it was exactly. A clever theme or mechanic was not enough for me to invest in. I wanted to do something else. It was an existential quandary. Why should my games exist. I wanted my games to have a purpose. To be inventions, rather than new designs. The best inventions solve problems people don’t see. This standard killed many of my projects. hardest hit were my board game designs. Board games are pretty good these days and there are few easy to solve problems with the form. Miniatures though, RPGs? These forms have so many things to solve. I dug back into development of my RPG and miniatures game. Here I could make a game starting with purpose, here was fertile ground for invention. Hi everyone! thanks for keeping up with this blog. Things are starting to get exciting behind the scenes for Seed RPG. If you follow my twitter you can dig through the photos and see some card revisions. I have been working on the game again and am very excited! It is my understanding that rpg’s are born from only the worst personal tragedy. This is the story of Seed RPG’s birth as an aborted Star wars rpg proposal. 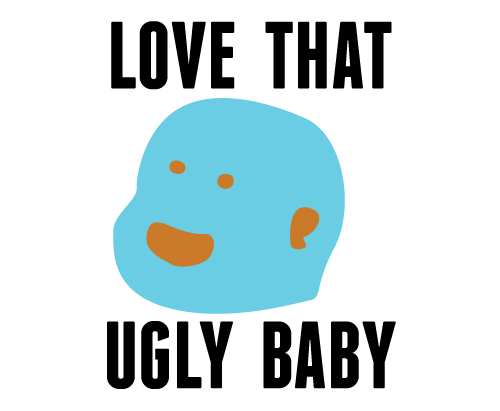 It even includes some baby pictures! Years ago I spoke with an editor at Wizards of the Coast and asked if I could pitch supplement products for their rpgs and the editor said yes. This was in the early SW Saga edition era. A month passed and i created a document that re envisioned how RPGs are formatted and sold. It never reached wizards because the editor had not known their policy was to not look at outside pitches when he said it was ok to pitch to him. Hurt by that experience but not broken. I salvaged what I could from that pitch and took it to other RPG publishers with strong systems that I could adapt to my product format. I wanted to adapt savage worlds, cortex, and other games to a component presentation. a few publishers looked, offered advice, some did not respond at all. this is fairly normal when pitching games. But ultimately it was not a good project for someone outside a publisher to bring to an established company, this was the sort of plan that a company is built on. 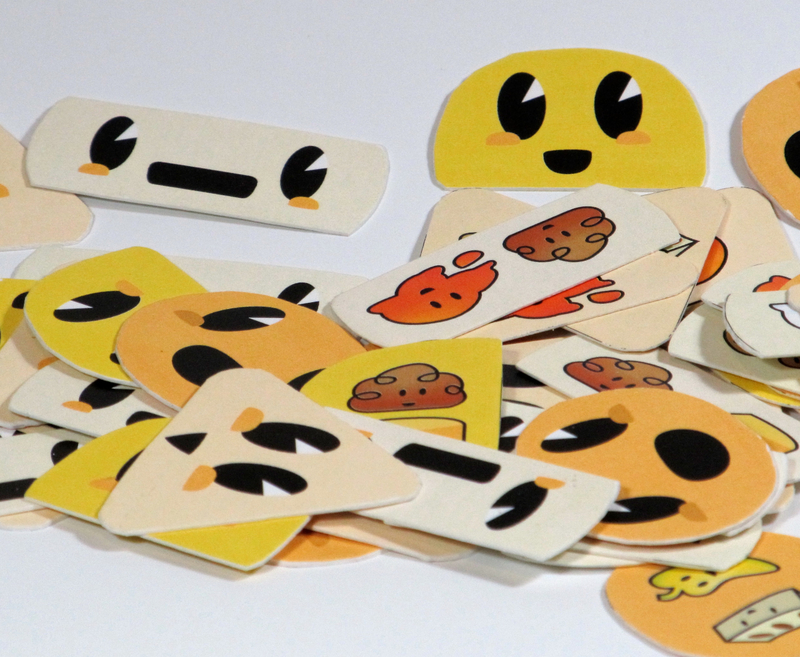 This was before kickstarter so I planed a new game, one simple enough to self publish. It eventually became Seed RPG and 0 hunters. I have shared bits and pieces of that pitch, most notable was the character sheet and character summary card i have yet to share the whole thing. It was gloriously naive of me to have made it and I still feel embarrassed about the whole thing it to this day, but what could i do, dreaming is not a choice. The ideas there are solid, but thats not the sort of thing you can bring to a publisher, thats what you use to build a publishing house. I am accepting applications for business people. P.S. I have started working on the project again in ernest. I’m cleaning up a few mechanics. Making a new spread sheet and working on a rules presentation. The call for a business person to help me manage this is a real one. be that someone who wants to start a new company or even a publisher who wants to help this game get off it’s feat. I have been a vocal detractor of the book as a way to facilitate RPG rules and play. So, if I don’t use books how do I do it? Some content leaves the book and becomes components like cards that feature the setting, items, or character building. These work great for things where you have many variants of the same kind of information. I have written about these examples before. What about the process of gameplay and it’s driving systems? The sort of content that is in a boardgame’s rulebook. Should that still be in a book? Traditionally yes it would be in a book, but I would say even this information needs to be something else. Systems in use are not liner, but learning a system is a liner process. There is a struggle between what order a game’s rules are best introduced for teaching and how the rules are formatted for reference during play. Most rulebooks attempt to serve both masters and suffer dearly for it. To start playing a game you need an overview of how everything works, not the details. The details are best learned as the game reaches those stages of play. However referencing a document formatted this way makes it difficult to find any particular rule. the rule you need may be in the overview, the details, components listing? Even the way reference and instruction are written is drastically different. There are some exciting games that prove there are good ways to avoid this conflict. “Risk (revised edition)” has a stunning rules presentation. using a folder with a few tabbed rules sheets. each sheet covers a system in the game, set up, attacking, reinforcement, and such. The sheets are used in order to teach a game but thanks to the format can be pulled from the folder to quickly reference any rule in the system. this is a great way to present a game’s rules and aid in teaching new players. Even better is the game “Legends of Andor” including an interactive teaching process that is entirely separate from the reference. One sheet guides the first few games, the other has the rules formatted for easy reference. Another interesting route is what Fantasy Flight has been doing with their game play videos. These videos introduce the player to the game but do not teach all the rules. you can watch a few short videos and then start playing, referencing the rulebook to find the specifics. If they adapted the rulebook to function as a reference only they could do some very slick work. A major road block i hit with 0hunters was when i tried to write a rulebook. I failed to remember these lessons. will be starting up development of this game again, by making a rules folder. expanding the presentation method used in my demo process and maybe making a video. 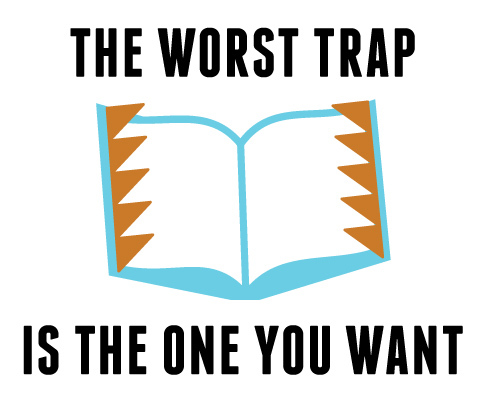 If your game should wonder into book it will be snared and few will ever play it. “These rules and components are a Game. They are a super explicit set of procedures and principles that will help you create the story of a bounty hunting crew. Some players will take on the role of the bounty hunters called player characters (PC) one player called the Game Master (GM) will take the role of the bounty head and everything else that opposes the PC. BOTH PC and the GM are subject to the rules. In exchange for subjection there is no need to do any special prep before playing, make difficult judgment calls or lack for inspiration. We start the game knowing your story has a beginning, a middle and an end but that is all. What happens along the way is the fun part. This is a roller coaster, not a railroad. Hi everyone! I wrote that up there and thought I would share it. I don’t know if it will lead to something in the rule book or not but eh, it was fun to write. This was inspired by a great panel about Apocalypse world at Pax Dev. So an update on this project. I have been having great success the past year with paper toys but the need to finish seed rpg has started to bubble back into my consciousness. Not much work has been done since pax last year aside from cleaning up a bit of book keeping. but this year I wowed a publisher with the game (and i was incredibly unprepared to pitch it), so maybe down the road we will see it applied to a license or something? that would be fun. I still hesitate to answer the call of self publishing but I will get over that soon enough 🙂 I am sure this game will get made eventually but it will likely not be my next kickstarter project.